Decadal- to multidecadal variability in the extra-tropical North Pacific is evident in 20th century instrumental records and has significant impacts on Northern Hemisphere climate and marine ecosystems. Several studies have discussed a potential linkage between North Pacific and Atlantic climate on various time scales. On decadal time scales no relationship could be confirmed, potentially due to sparse instrumental observations before 1950. Proxy data are limited and no multi-centennial high-resolution marine geochemical proxy records are available from the subarctic North Pacific. Here we present an annually-resolved record (1818–1967) of Mg/Ca variations from a North Pacific/Bering Sea coralline alga that extends our knowledge in this region beyond available data. It shows for the first time a statistically significant link between decadal fluctuations in sea-level pressure in the North Pacific and North Atlantic. The record is a lagged proxy for decadal-scale variations of the Aleutian Low. It is significantly related to regional sea surface temperature and the North Atlantic Oscillation (NAO) index in late boreal winter on these time scales. Our data show that on decadal time scales a weaker Aleutian Low precedes a negative NAO by several years. 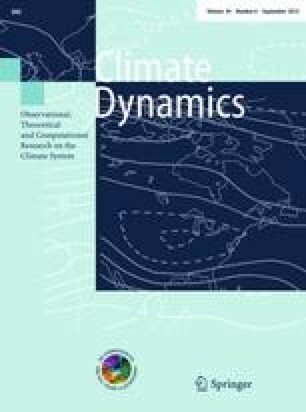 This atmospheric link can explain the coherence of decadal North Pacific and Atlantic Multidecadal Variability, as suggested by earlier studies using climate models and limited instrumental data. The online version of this article (doi: 10.1007/s00382-011-1229-4) contains supplementary material, which is available to authorized users. We thank B. Williams, R. Greatbatch, and M. Latif for discussion and helpful comments. This research was funded by the Alexander von Humboldt Foundation (Feodor Lynen Fellowship to S. H.), the Deutsche Forschungsgemeinschaft (grant HA 3238/2-1. 2-2 to J. H. and A. K.; and Emmy Noether grant KE 1471/2-1 to N. S. K and J. V. M), a Natural Sciences and Engineering Research Council of Canada Discovery Grant and a Canadian Foundation for Innovation and Research and Ontario Research Fund Grant (all J.H.). Two anonymous reviewers are thanked for their valuable comments that greatly improved this manuscript.